Unlike a PAC, whose finances are made public, Paul's nonprofits can raise unlimited money and aren't required to disclose where it came from or how it was spent. 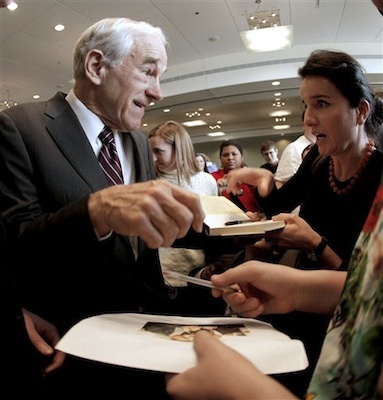 IOWA CITY, Iowa — The passionate support of an eclectic group of libertarians and young people has Ron Paul in contention to win the Iowa caucus. So has the work of two well-funded nonprofits that for the past three years have kept his aides employed, his volunteers organized and his ideas afloat. Those nonprofits, including Paul’s flagship Campaign for Liberty, blur the line between his presidential campaign and issue advocacy in a way experts say runs afoul of the spirit, and perhaps the letter, of federal tax and campaign finance law. But unlike a political campaign organization, whose finances are tightly regulated and made public, such advocacy nonprofits can raise unlimited sums of money and aren’t required to disclose where it came from or all the details about how it was spent. Paul, a 76-year-old Texas congressman, finished fifth in the 2008 Iowa caucus and abandoned his long-shot presidential campaign that summer. As he left the race, he urged his supporters to continue their fight for libertarian principles by joining his new group, the Campaign for Liberty. He called the transformation of his presidential campaign into the nonprofit a “legal formality” that would allow him to continue building his famously energetic network of volunteers, online activists and college students. The Campaign for Liberty and Young Americans for Liberty, a separate group formed to spread his message to high school and college students, were organized as “social welfare organizations” under U.S. tax law. That means they cannot make politics and promoting candidates their primary activities. The groups quickly found a home in the tea party movement, hosting conferences, training activists and distributing petitions asking members of Congress to support one of Paul’s signature policies — a plan to audit the Federal Reserve. The Campaign for Liberty raised more than $13 million between 2008 and 2010 that paid for direct mail, telemarketing, staff salaries and other expenses. The group claims more than 600,000 members and more than 170 chapters of Young Americans for Liberty at high schools and colleges. Drew Ivers, who founded the Iowa chapter of Campaign for Liberty, said the nonprofit’s goal was never to lay the groundwork for Paul’s 2012 presidential campaign. Organizers were careful to separate political work from the work of advocating Paul’s ideas, he added. But he acknowledged the organization has helped Paul in Iowa, which will hold its first-in-the-nation presidential nominating caucuses on Jan. 3. “It kept the ideas alive. And as people who were involved in the Campaign for Liberty liked the idea of limited government, they look at the field of presidential candidates and say, ‘You know, I think Ron Paul is serious about this idea,'” Ivers said. The other candidates from 2008 who are again running in 2012 also took steps between campaigns to build their political clout. President Barack Obama formed his “Organizing for America” group at the Democratic National Committee, while Republican Mitt Romney used a political action committee to raise money, shower donations on lawmakers and pay for his travel to key states. Paul had a PAC, too. But the finances of both the DNC and political action committees such as Romney’s Free and Strong America PAC — unlike Paul’s nonprofits — are regulated by the Federal Election Commission and subject to financial disclosure rules. Between the 2008 and 2012 campaigns, both nonprofits were stocked with Paul aides and relatives. Ivers served as Paul’s Iowa campaign chairman in 2008 and holds the same position again this year. The Campaign for Liberty’s president, John Tate, was paid a total of $338,000 by the group in 2009 and 2010. He is now Paul’s national campaign manager. The nonprofit’s senior vice president was Jesse Benton, who is now Paul’s campaign chairman; its vice president was Debbie Hopper, who is now Paul’s assistant campaign manager. Lori Pyeatt, Paul’s daughter, served until recently as the Campaign for Liberty’s part-time secretary and treasurer, earning $34,000 for her work last year. Her daughter is married to Benton. Paul’s son Ronnie is the group’s unpaid chairman. In all, nine out of the 16 staff members at the Campaign for Liberty are on leaves of absence from the group to work for Paul’s campaign. The nonprofit’s executive director, Matthew Hawes, said the group is still able to function and is an active advocate on state and federal issues unrelated to Paul’s presidential campaign. Paul campaign spokesman Gary Howard — who for 18 months served as the Campaign for Liberty’s spokesman — said Paul resigned as Campaign for Liberty’s honorary chairman when he joined the presidential race and believes the nonprofits complied with Internal Revenue Service rules. Still, like Ivers, he acknowledged the nonprofits have indirectly aided the campaign by training activists and raising his issues. Paul isn’t the first to use such a strategy to keep his name in the public’s view between bids for the White House. Democrat John Edwards did the same between the 2004 and 2008 campaigns by founding a nonprofit center dedicated to fighting poverty, his central campaign issue. Federal investigators later issued a subpoena for information about Edwards’ nonprofit, according to details previously provided to The Associated Press. An attorney for Edwards has said the nonprofit paid money to Edwards’ mistress’ video production firm, and the former senator from North Carolina was later indicted on campaign finance charges related to payments from wealthy donors that were used to help hide the woman. Marcus Owens, a Washington lawyer who headed the exempt organizations division at the IRS from 1990 to 2000, questions whether such nonprofits were truly designed to serve the “social welfare purpose” as required by law. In Paul’s case, the groups also helped his son’s political career. At least two aides from the Campaign for Liberty left to help Rand Paul win election to the U.S. Senate in Kentucky last year.